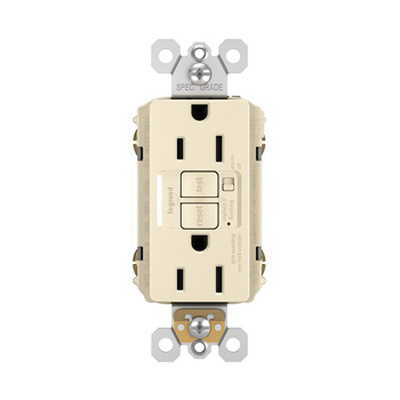 Pass & Seymour Radiant® 2-Pole 3-Wire Tamper-resistant self-test GFCI duplex receptacle in light almond color, has voltage rating of 125-Volt AC and current rating of 15-Amps at 60-Hz. It has short-circuit current rating of 10-Kilo-Amps. The specification grade receptacle accommodates 14 - 10-AWG solid/stranded copper conductor. It features back and side wired terminal connection for easy installation. It has nylon body and face. It features high-impact-resistant thermoplastic construction. It measures 4.2-Inch x 1.73-Inch x 1.03-Inch. The receptacle withstands dielectric strength of 1500-Volts. It has 0.03-Inch brass contact for optimal conductivity and extra-long galvanized steel strap. It withstands temperature range of -35 to 66 deg C.
The auto-ground receptacle has NEMA 5-15R configuration. It is suitable for use in industrial, healthcare, education, institutional, retail, office, hospitality/lodging, multiple dwelling applications. The receptacle is screw mountable. 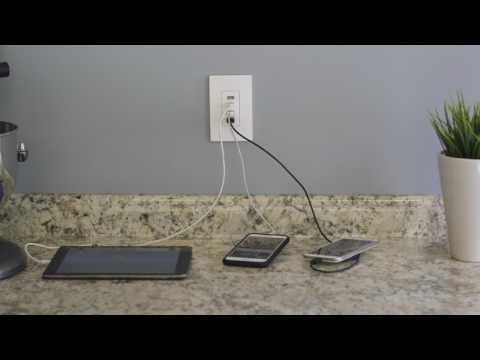 The receptacle has audible trip alert provides alert about disconnection of power from load plugged into or fed from the GFCI. It has UL94 V2 flammability rating to withstand harsh environmental conditions. Receptacle with patented SafeLock® protection, features tamper-resistant automatic shutter system. It has trip indicator light and ground terminal clamp. Self-test GFCI duplex receptacle is UL/cULus listed and meets federal specifications.